Did you know that if you asked 1000 people what creature they would like to be for one day the most popular answer would be a butterfly? When you think about it, it does make sense. They are gorgeous to look at, do no harm to anyone, and happily flutter around from flower to flower. 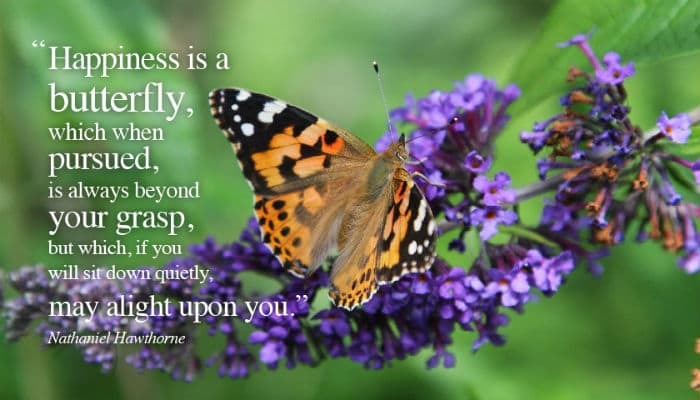 American author Nathaniel Hawthorne took great inspiration for the butterfly and one of his most famous quotes “Happiness is a butterfly, which when pursued, is always just beyond your grasp, but which, if you will sit down quietly, may alight upon you” appears on these Beautiful Inspirations business ecards. The close up shot of a Red Admiral on a sprig of lilac is quite exceptional, and goes hand in hand with the message this ecard conveys. We are all surrounded by people who need inspiration at time, and a word of encouragement, and these ecards offer the perfect way to do this when that somebody is a person you know through work as opposed to a close friend or family member. Add a personal message if you want, send it via email and who knows what profound effect this little ecard may have on that person. If your business already uses ecards at Christmas time or would like to consider them then why not pop over and see our market leading corporate Christmas ecards.